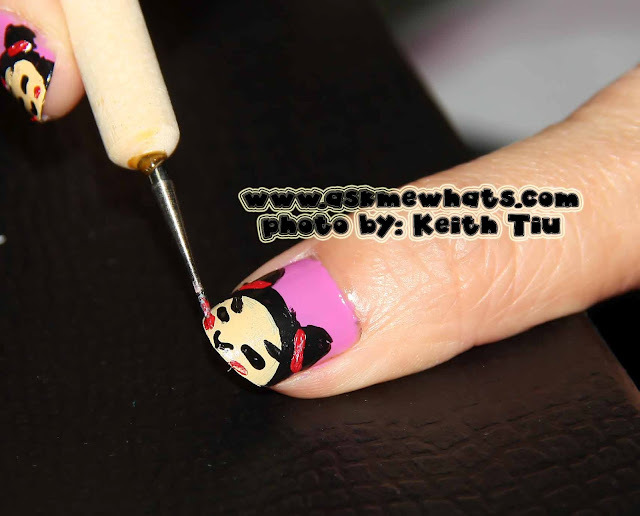 Nail Art Tutorial: I am Pucca! 11 years ago, fresh from college and Dial-up connection was still a hit back then, I love browsing through internet checking out random websites because I am so intrigued with anything outside my territory! As "then boyfriend" Mr. AMW was helping me out with my super slow computer, we chanced upon a site called Pucca Club and we got drawn into her cute chinky eyes and big cuddly face! We patiently loaded each animation and watch how she chased the love of her life --- Garu! Apply your choice of base coat to protect your nails from yellowing. I used Zoya Base Coat. For the base color, I applied 2 coats of Essie Polish in Splash of Grenadine. Since I started doing this nail art design at night, I wanted my design to dry up pretty quickly so I used Acrylic Paints. 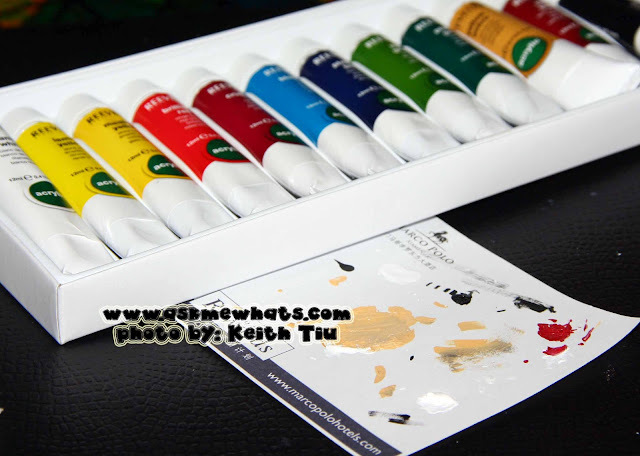 With a paint brush from bookstore, I drew an oblong shape as shown on photo below. I also created the cute hair bun of Pucca with black Acrylic Paint. I do not have any flesh tone polish so I mixed white and yellow acrylic paint to create "flesh" tone closes to Pucca's face. I drew inside the black oblong shape. 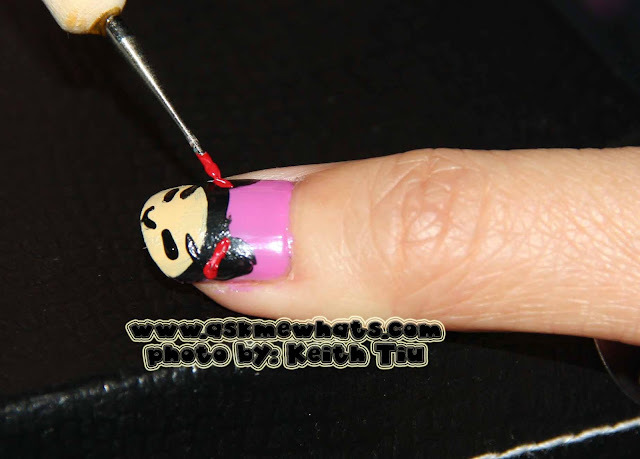 With a 2-way Nail Art Pen in Black, I drew Pucca's eys and mouth. Draw a white line on Pucca's hair to act as ribbon. I used a white base for the red color to appear brighter. Since I do not have a bright red 2-way nail art pen, I chose to use a Bright Red Acrylic Paint and apply the color on top of the white line with a dotting tool or brush of choice! 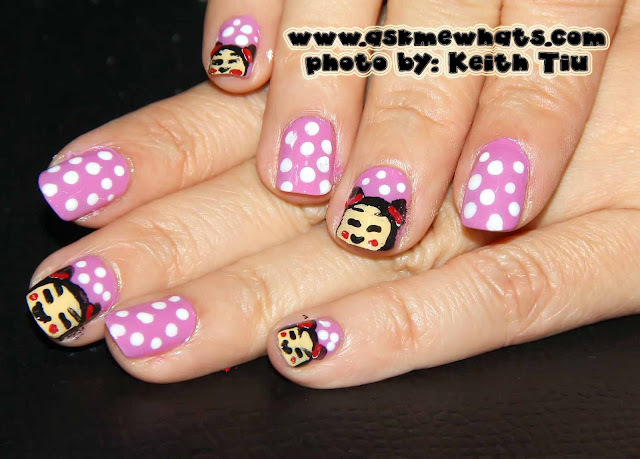 You can choose to draw Pucca's Face on all nails but I find it to be overwhelming, so I created simple dot designs on alternate nails. Protect your nail art design with your choice of top coat. Just so you know, I cut my nails short because I am having a hard time typing! This is a perfect example to show you that you can still do nail art designs with short nails! 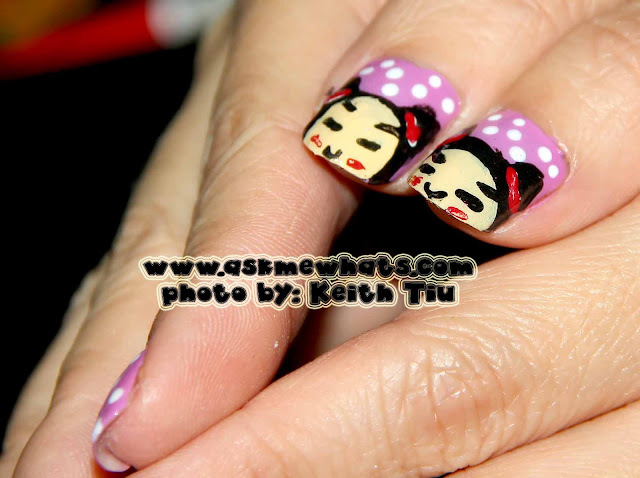 Do you like Pucca as much as I do? When did you first learn about Pucca and how? I've always thought that if someone is good in drawing s/he can also be a very good makeup and/or nail artist. hahahh no worries, not everyone are good in all! I'm just ok at drawing nails, NEVER on paper! She is!!!! She's full of cuteness!!!!! So cute! Those polka dots are a very nice touch! kawaii!! 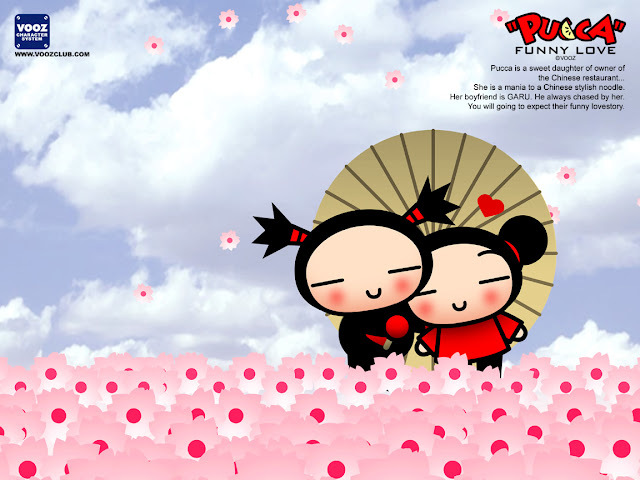 :) I like pucca so much! your so talented! Thank you Calin, wow! So many people adores Pucca!!! !